We stock hand sewing needles and Schmetz machine sewing needles. 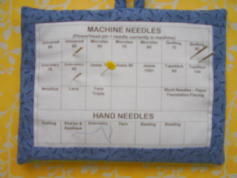 Please click on the category below to select the type of needle you need. If you are not sure which needles would be best for your project or the weight of thread you are using, click on Meg's Thread & Needle Guide. Please feel free to contact us (01264 771443) if you would like further guidance on selecting products.